Ozzy Osbourne may be notorious for biting the head off a bat, but two of his bandmates in pioneering heavy metal band Black Sabbath would rather worship seitan. 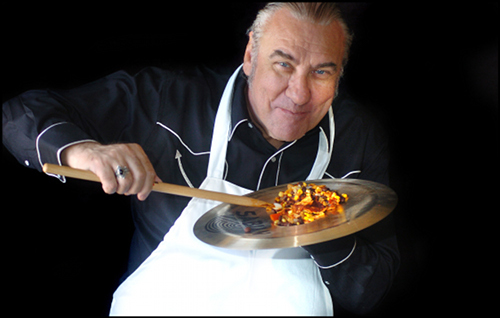 Yes, bassist and lyricist Terry “Geezer” Butler and drummer Bill Ward have both been longtime vegans. Bassist Geezer Butler, who penned the lyrics for Sabbath’s anti-war classic “War Pigs,” described to PETA how he went vegetarian at age eight. After cutting into a piece of meat and seeing it bleed, he asked his mom where meat came from, and “that was it.” Butler tells Attention Deficit Delirium he went fully vegan a few decades ago and is against all animal cruelty. A few years ago Butler campaigned with the Humane Society of the United States in support of a bill that would ban the inhumane practice of declawing cats in the state of New York. Geezer and his wife Gloria, who is an artist manager and board Vice President of the Animal Museum in Los Angeles, campaign against puppy mills and live with numerous rescue animals. As of a few years ago, they lived with 5 rescue dogs, and 7 rescue cats. 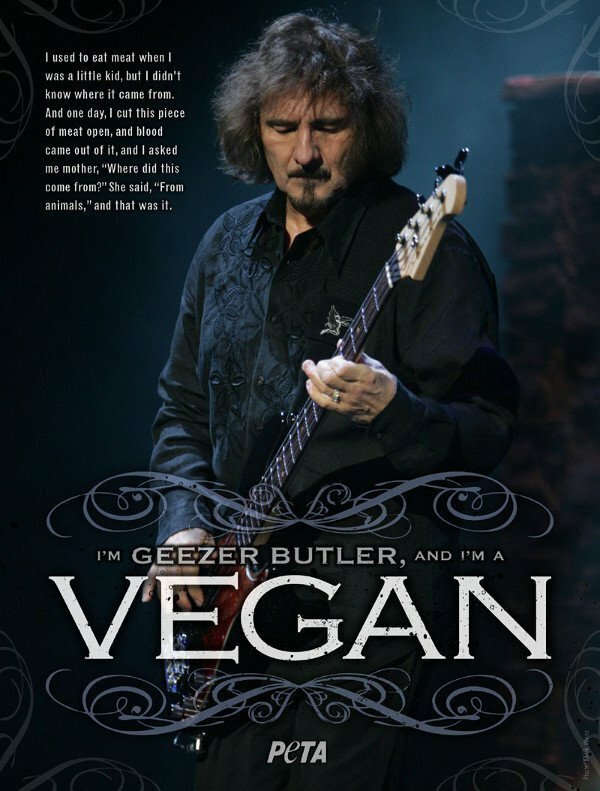 You can buy one of Geezer Butler’s signature vegan guitar straps here. 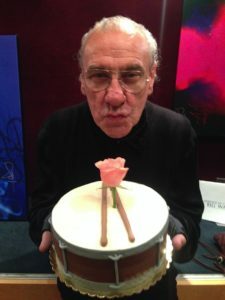 It’s less widely-known that Sabbath drummer Bill Ward is also vegan – or at least he was for a long time – the last mention I could find was from 2014 – his diet doesn’t come up as often as Butler’s and he didn’t write back to my e-mail. Ward’s website links to a 2009 interview he did with the now defunct “Rock N Roll Cook.” There Ward shares his own vegan enchilada pie recipe and credits veganism with improving his stamina as a drummer. He also says that he and vegan bandmate Geezer Butler regularly go out to vegan restaurants together – they both live in California. Sadly, Ward fell out with the other members of Sabbath in 2012, so the Butler-Ward vegan dinners may be no more. But it doesn’t look like the fall-out has affected Ward’s lifestyle. In 2013, he told Eat Pray Rock that he was inspired by his wife to go vegan. They initially made the switch for health reasons, not to save animals, but he adds “it has become that, of course.” His website shared a picture of his vegan birthday cake in 2014. I was able to salvage the “Rock N Roll Cook” interview and recipe using the Internet Archive‘s WayBack Machine and have reposted the recipe below but will remove it if asked. Dice and saute onions and peppers in garlic and oil over medium heat for approximately 5 minutes. Drain and rinse beans and corn, add to pan and mix together. Cut tortillas into 1 x 2 inch strips (approx) and cheese into 1/2 x 1/2 inch pieces. Line a 13″ x 9 ” pan with about 1/3 of the tortilla strips and spoon enchilada sauce to cover. Layer with 1/2 of the bean/veggie mixture and dot with half of cheese pieces. Repeat with all layers and end with tortilla strips and enchilada strips on top. Garnish with twigs of cilantro (coriander) and serve. And what about the rest of the band? Lead singer Ozzy Osbourne tried to go vegan in 2011 but only lasted a few weeks. His wife, Sharon Osbourne, who created OzzFest and manages Ozzy as well as other artists like Motorhead and Lita Ford, is an anti-fur activist and rescue dog guardian. Tony Iommi is not vegetarian or vegan as far as I know. In his book “Iron Man: My Journey Through Heaven and Hell with Black Sabbath,” Iommi talks about the difficulty Geezer had finding vegan food in the early days of touring.